Zarfund is one of the best and legit ways to make money online. The program can make you rich if you choose to invest a one time payment of 0.03 bitcoins which is about N13,000 naira and the Transaction Hash ID is used to validate payments on the platfom. We already gave a splendid review of Zarfund with video guides and reasons why you need to invest in it here. So, you may want to take a look before you continue reading. Although as simple as this program seems, many newbies still find it difficult operating Zarfund account from their back-end. One vital issue that is threatening the free flow of Zarfund members from one Level to another is the submission of Transaction Hash ID# after making donation. Which was supposed to be done automatically. This issue arises few days ago after Blockchain upgrade their website, then the automatic verification of donation made to Blockchain account was affected. They just have to verify payment manually from their support center. Although they promised to resolve the issue soon as their technical programmers are working to put things in other. To Upgrade your Zarfund account means making the necessary donation to another member above you, before moving to the next level. After sending Bitcoin you will need to submit Transaction Hash ID to confirm the donation made. 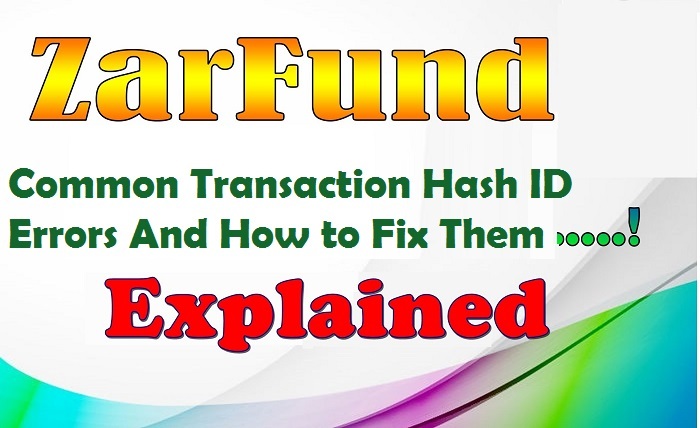 This works fine most of the times but in some few cases, you will be faced with some error messages and we have compiled common errors with Transaction Hash ID# and how to fix them. Zarfund is a very roburst system with over 2,000 members as at the time of putting this article together and it has superb team support. So, on every member dashboard, you will find a direct link to contact support when members are faced with any issue. Error messages like Transaction Hash ID erros described above can be resolved and your zarfund account will be upgraded manually. Follow these steps to resolve yours. To submit a support ticket, go to your dashboard, click on Support. Signup to submit a ticket, enter your details correctly and click register. You will be sent an activation email. Log in your email and click on the link to activate it and set up your password. After doing all that, login and submit your ticket. Try to screenshot the area you encountered the problem and upload it as a photo. You will be asked to submit the transaction Hash ID# also. After submission, wait for some few hours and check back. If the issue is not yet resolved, then do this. Log in your Zarfund account, click on Upgrade, then go ahead to submit the transaction hash ID# and click submit. It should work now. It works for me that way. Note that, if you just created the account, you should try and upgrade it to Bronze Level before 48 hours. If you have any issue, drop a comment using the comment box below. Want to register under a fast growing team that offers free referrers? Click here here to register.